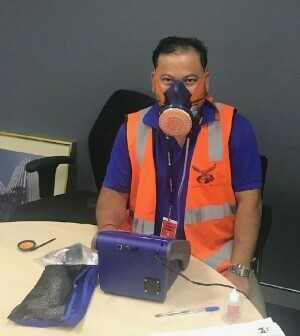 As part of SERS ongoing commitment to provide services to meet our clients every need, we have extended our HAZMAT industry services to include respirator fit tests. SERS will offer Quantitative fist testing from our Sydney office and at your workplace using the TSI PortaCount PRO. A quantitative respirator fit test works by measuring the competence of a respirators fit by numerically measuring the amount of air leakage into the respirator. This method is superior to qualitative tests that make use of the subjects own sense of smell, taste, and sensitivity to the irritant chemicals used. Our fully trained Occupational Hygienists will be offering the professional service and accurate outcomes to ensure compliance and the safety of your employees. Fit tests can be booked and coordinated with other site services SERS offers at your convenience, negating the need for workers to leave site for testing. SERS can mobilize qualified personnel and equipment to any site across Australia to conduct quantitative fit testing, including mine sites, training centers and removal sites. The entire process takes about 10 minutes per person.